A NOTE FROM SHAWNA: When I find a good article I would like to share with you, I will (if the rights for the source allow it), reprint it here for you to enjoy. This does not necessarily indicate a relationship with the source and is not paid content. This post was written by acupuncturist Katherine Altneu, originally posted on the blog for her Denver practice, and is reposted here with her permission. Pregnancy is different for every woman. Some women get debilitating fatigue, others get incapacitating nausea, others get leg cramps or insomnia. I don’t think there’s one foolproof way to make it through the symptoms that often accompany pregnancy, but here’s what I learned about managing and minimizing many of those symptoms. To be honest, so far I haven’t been terribly impressed with the level of prenatal care I’ve experienced. I’ve seen both an OB and a Midwife group, and while I like the doctors I’ve worked with, believe they really do care about me and feel safe and that I’m in good hands, I also feel like a LOT is missing from the conversation. Prenatal care feels basically like emergency prevention & management. Going to see them makes me feel relieved to hear the heartbeat or see the baby via ultrasound. But other than that, they pretty much just check my blood pressure as if to say “Well, you don’t have preeclampsia yet!” and then they basically just tell me: “Wear your seatbelt, and don’t get Listeria”. Um, thanks. Got it. Yeah, all their nutritional advice is all about avoiding Listeria. It’s NOT about getting adequate or even optimal nutrition for the baby or mama. My goals are more than simply averting a medical crisis after all. Can’t we avert medical crises AND talk about optimal health and nutrition for BABY and helping ME feel my best as well? So many doctors just tell you that it’s “normal”. Morning sickness is normal. Fatigue is normal. Bloating and gas are normal. And yes, all of these symptoms are very common, and it can be nice to hear that. But common doesn’t make them NORMAL or necessary or mean that they’re not AVOIDABLE or a sign of an underlying imbalance or deficiency. In fact, many common pregnancy complaints and complications are associated with vitamin and nutritional deficiencies. Which means they can also be rectified pretty easily! Often, we don’t need to just accept these symptoms as NORMAL. For many of these common pregnancy symptoms, there are strategies and tools we can use to prevent them, minimize them and alleviate them. 1. Keep your blood sugar balanced. A precipitous drop in blood sugar is often the cause of nausea and morning sickness, and we usually don’t even realize that our blood sugar has dropped. What’s worse, the conventional advice to eat crackers and bread is NOT good advice. These simple carbs break down into sugar very quickly, causing a quick spike and then a quick drop in blood sugar – bringing on nausea once again and causing a vicious cycle. While I know carb cravings are typical in pregnancy, and other foods can often seem unappetizing, try your best to avoid the simple carbs, and opt for foods that will keep your blood sugar more stable. Eat small amounts of food frequently. This helps keep your blood sugar stable. Eat protein and fat anytime you put anything in your mouth. If you must eat that cracker, then pair it with avocado, cheese, hummus, almond butter – something with fat and or protein – this will keep your blood sugar stable and minimize nausea. During the first trimester of pregnancy, your body starts pumping out hormones which slow down the muscles of your digestive system, bringing your digestion to what feels like a screeching halt. This can lead to bloating, constipation, and can be a cause of morning sickness. I started supplementing with a digestive enzyme at every meal. This helped me digest, absorb, and assimilate the nutrients from my food. Digestive enzymes can help prevent and alleviate morning sickness, bloating, indigestion, and heartburn. I like this one from Designs for Health because it doesn’t contain hydrochloric acid, making it great for treating heartburn later on in pregnancy as well. Take two per meal. A probiotic can also help with constipation, and ginger can also support your digestion. I loved slipping a slice of fresh ginger into hot water to make tea. Easily digestible foods are your friends. When you hear easily digestible, you might be thinking about saltine crackers, white rice, and pasta, but these don’t pack enough nutrition for you or your baby and can lead to the spike and then drop in blood sugar that triggers nausea. You need protein and vegetables! And although too much fiber can be too taxing on your digestion, you do need some fiber to keep things moving and avoid constipation. Fruits and watery vegetables have good amounts of fiber but are easier to digest. Cooking hard vegetables until they are very soft helps make them tolerable, and cooking them into soups is even better. Morning sickness can also be caused by the liver being swamped with hormones. The increased flood of pregnancy hormones is equivalent to taking 100 birth control pills a day. Holy guacamole, that’s a TON of hormones! Your liver has to process all those excess hormones and help your body detoxify from the excess hormones each and every day. That’s a lot of extra strain on your liver. This liver stress can also contribute to morning sickness, emotional volatility, and fatigue. So you want to do everything you can to support your liver. Milk Thistle can help. I’m supplementing with Milk Thistle throughout my pregnancy, it’s perfectly safe. It’s also great to continue post-partum to help with breast milk supply and is safe during breast feeding. Stay hydrated. Make sure you’re drinking enough water to both flush out toxins and help your liver, as well as to make sure you’re supporting the adequate development of amniotic fluid. Lemon in water can help your liver as well. I switched to this as my morning ritual in place of coffee, and it felt really good. Get moving. As much as you don’t feel like moving from the couch, forcing yourself to get up and walk, do yoga, go to a fitness class, or just generally getting your blood flowing is 100% going to make you feel better. Of course, be gentle with yourself, I don’t recommend picking up running during pregnancy if you haven’t been a runner before pregnancy, but generally it’s safe to continue to do what you did before you were pregnant. Talk to your doctor about what exercises and activity level are best for you. Even gentle movement like yoga will help get the blood flowing, support your liver, and help you feel better. Protein and iron deficiency can contribute to symptoms of fatigue. You want to aim for 75 to 100 grams of protein a day. Protein helps the growth of the baby and is important for its brain development. It also helps your uterine tissue to grow during pregnancy, and it plays a role in your increasing blood supply. If you’re feeling fatigued, think about increasing the protein in your diet. Red meat is a great option for protein in pregnancy because of the iron content, try to get it at least a few times a week. Your blood volume is going to double by the second trimester. But your plasma increases faster than your red blood cells, leaving you functionally anemic for a bit while your red blood cells are catching up. This anemia can contribute to fatigue. Iron helps increase your blood volume and prevents anemia. A daily intake of at least 27 milligrams is ideal during pregnancy. Many pregnancy symptoms and complications are actually associated with vitamin and mineral deficiencies. You don’t have to just accept them. These symptoms are not just something to suppress or ignore, they are cries for help and calls you should heed. They can signal to you that you need more of a certain nutrient. Magnesium is a very common deficiency and can lead to many different symptoms – leg cramps, headaches, migraines, and insomnia. 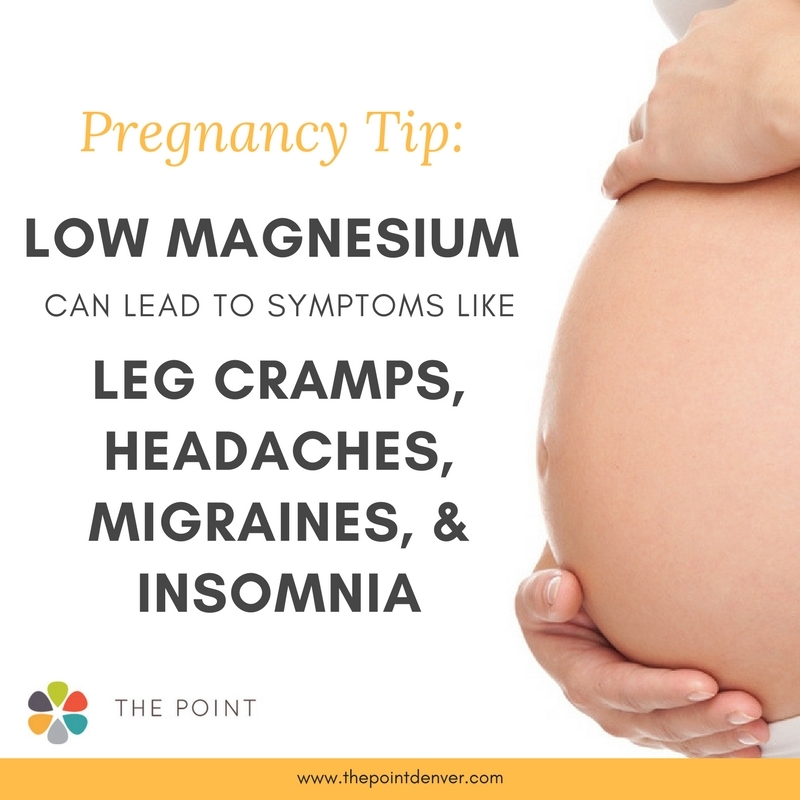 Your prenatal probably has a little magnesium in it, but you need much more. I love Calm Vitality [note from Shawna: my Oakland office has it available in our pharmacy in a variety of flavors/unflavored], which is a powder that you add to warm water. I like taking it before bed. It’s perfectly safe during pregnancy, and it’s not fat soluble so you can’t really overdose on it, it will just cause loose stools if you have taken too much. If that happens, just back of the dosage a little bit. CoQ10 and Vitamin B12 are needed in every cell of your body for energy production, cell division, and cell reproduction. So as your body is transforming that little embryo into 10 trillion cells you are going to need plenty of these ingredients and building blocks for new cells and energy. If you’re suffering from a lot of fatigue, consider supplementing with these. And of course, Vitamin D and fish oil are a great idea during pregnancy. They are necessary for the baby’s growing skeleton and growing brain. 6. Listen to your body, give yourself a break, and take care of yourself. My advice to ANY pregnant woman is to treat themselves with the same grace and forgiveness that they would their best friend or sister. The first trimester is pretty thankless – strangers can’t tell you’re pregnant so they can’t sympathize, you can’t feel any movement or signs that the baby is ok, and you feel off emotionally and/or physically without having anything to show for it. All this can get you down but if you give yourself a break, it will make things easier. Understand and accept that your body and mind are changing, and try to be gentle on yourself when you get frustrated that you aren’t feeling up to whatever activity you used to do before you got pregnant. 7. Try not to feel guilty. When I was suffering through fatigue, here are the various guilty thoughts that went through my mind: I’m not cooking. I’m not helping my husband enough. I’m lazy. I’m not exercising like I used to. I’m eating dinner and it’s still the afternoon. …Just let it go. You are being put to the test, both physically and mentally, but it’s only temporary. And, as I used to tell my husband repeatedly… “I’m growing eyeballs!”. As in, “Sorry, not sorry… you can cook and do the dishes tonight… I’m growing eyeballs.” Haha, for some reason that visual just really blows my mind and perfectly illustrates the amazing but invisible work and creativity our body is doing. So give yourself grace and gratitude, because you’re growing a human! Isn’t it amazing!? Acupuncture is wonderful at relieving so many of the symptoms that can accompany pregnancy. It relieves nausea, helps support the liver, balances blood sugar, boosts digestion and energy levels, helps with stress and anxiety, and even reduces the chance of miscarriage. 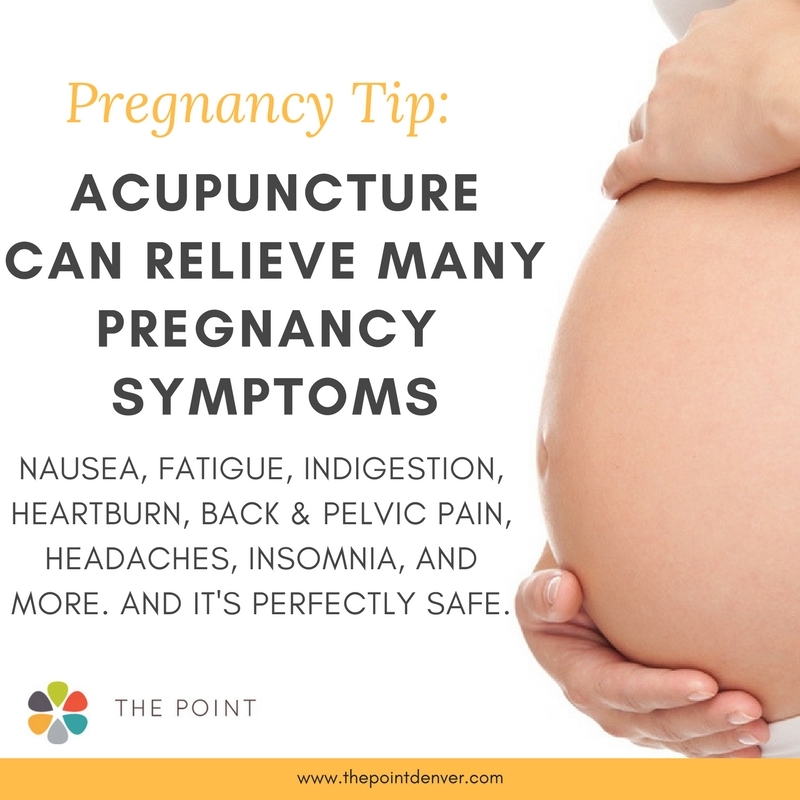 Acupuncture is perfectly safe during pregnancy as long as you’re seeing a well-trained acupuncturist who is familiar with the precautions and specific points we avoid during pregnancy. I love treating and supporting pregnant women in my clinic! And I love getting treated throughout my pregnancy as well. Hopefully these strategies will help you beat the nausea, fatigue, bloating, constipation, and other symptoms like leg cramps and headaches that are so often considered “normal” in pregnancy, but that can totally be prevented and alleviated! Katherine Altneu, L.Ac. is an acupuncturist & herbalist, the founder & clinic director of Denver's The Point Acupuncture & Holistic Medicine, LLC and the creator of the Becoming Mama program. After suffering from ailments her doctors couldn’t diagnose or treat, she discovered the healing power of Chinese Medicine. Blown away by its effectiveness and determined to share it with others, she quit her job as a financial analyst to pursue her Masters of Science in Traditional Chinese Medicine focusing on treating fertility and women’s health. She’s passionate about blending ancient Chinese Medicine with modern science and empowering women to take charge of their health and fertility. Connect with her on Facebook, Instagram, and Pinterest.